Buy this book with Web Services Security by Mark O'Neill today! Quickly learn how to build a secure Web services system using available programming tools, models, and specifications. Covers the different ways to create a secure .NET Web service. Softcover. Mastering Web Services Security provides a valuable enterprise perspective on building secure Web Services applications. Rather than focusing on a single technology like .NET or Java, the book provides useful real-world guidelines for building Web Service based systems that use many different products. Some previous reviews of this book thought that EASI was exclusively a description of the product from the authors' company. I didn't see it that way -- in fact, I didn't see any specific details describing vendor products based on EASI. I viewed EASI more as an architectural technique that can be applied to many vendor products. Different Web Services vendors of Service Oriented Architectures (SOAs) offer frameworks that look like EASI, which makes this book useful when evaluating those alternatives. The book does a great job explaining how to build non-trivial WS systems that are secure from end to end. Instead of limiting the material to descriptions of SOAP-related technologies and their security (this is what the other books I've read on WS security do), the authors first explain how to secure quickly a simple homogenous (M$-based) WS application, then point out the problems with such a simple-minded approach, and then devote the rest of the book to the question of securing complex heterogeneous WS applications by putting all necessary pieces together. The first part also has a good introduction into the building blocks for WS security solutions, including not only SOAP and XML security, but also security of the underlying middleware technologies. Here, they could do a better job on going into more details about WS-Security spec and its friends. In the second part, they show how to use those building blocks together. Again, chapters on security of Java-based WS and the security interoperability lack a good structure and some times are just confusing. From reading the book, it became clear to me that WS security is yet another instance of the old problem of enterprise security integration, although with a SOAP twist. Therefore, many methods from middleware security can be used for securing WS applications. I would recommend reading this book only to those who build complex heterogeneous WS applications. This book covers the basics and fundamentals of Web services security and industry specs to an extent and quite good. This book promotes Quadrasis EASI security kit (like a UserGuide) which made me so annoying! It does not provide practical examples from industry leading security vendors like Netegity TransactionMinder, SunONE Identity server etc. If you are looking for implementing XML Security using Netegrity TransactionMinder, Microsoft Passport, SunONE Identity server..then this book is a WRONG CHOICE. You may find this book more appropriate if you are a Quadrasis user. If you are looking to compare this book with "Mastering EJB" by Ed Roman then you are making a big mistake! This books is very focussed on Quadrasis EASI implementation ( I never heard off). (+) Good high level book for concepts. (+) This book covers well all emerging Web services security specs including WS-Security, SAML, .NET Security etc. (-) Only address Proprietory technologies from Netegrity and Quadrasis (Quite upsetting). (-) Not enough examples to cover all the security specs. (-) No discussion on implementing Liberty and Passport technologies. - The writing and examples are clear. The glossary is a nice touch. The book avoids spending much time on a "101 of Web services" section, and that's probably a good thing, since plenty of books cover that already. Plus, anyone who buys this book will know the basics of Web services already. - Much of the book focuses on applying the Quadrasis "EASI" security framework to Web services, unsurprisingly I guess since the four authors all work for Quadrasis. Some of the code examples require an instance of the EASI framework to work, which is limiting to people who are not using Quadrasis software (I don't think there is anyone else with product which implements the EASI framework). For examples of authentication and authorization in Java, i'd prefer to have seen JAAS used. 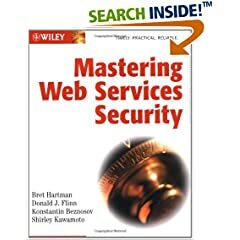 I think the book would have been more accurately named "Mastering Web Services Security using the EASI Framework". - Any book on Web services security right now is going to be a picture of a moment in time, because of the evolving standards in this area, e.g. information about timestamps and nonces in WS-Security isn't included, so probably the book was written before the WS-Security Addendum was released. Ditto WS-SecureConversation, WS-Policy, and WS-Trust - most likely published after this book was written. I'd like to have seen this information, plus concrete information about SAML assertions in SOAP messages, in the book. - XKMS is missing from the book. This was a big surprise, since like most people, I'd see XKMS as a fundamental Web services security technology. Also, XACML only gets a half a page. - The sections on the IIS web server are very strong. - Netegrity SiteMinder is covered, but Netegrity TransactionMinder is not. This was a surprise. So overall, this book is strong on the EASI framework, and is well written. If you think you're likely to use EASI for your Web services security, I'd definitely recommend it. Patterns everywhere: A list by "alessandroribeiro"